5 Things I Am Believing God To Do For You In 2017! On New Years Eve 2016, while in a time of fasting and prayer, preparing for our 46th Annual Morris Cerullo World Conference, (which was set to begin here in Dallas the following day), God showed me five prophetic promises that He encouraged me to take hold of 2017 (and which have already begun to come to pass in a significant way) that I believe are not just for me and my house, but as I write these words, I am believing they are for you and yours starting right now! Two important words:God is imparting to you a new level of DILIGENCE and FEARLESSNESS in 2017! 1. YOUR FEARS WILL NOT BE FULFILLED AND YOUR HOPES SHALL BE GRANTED! If you have been made righteous by Christ, you belong to Him. Though Proverbs 10:24 says “the fears of the wicked will be fulfilled…” I declare YOUR FEARS WILL NOT BE FULFILLED, and Proverbs 10:24 continues, and YOUR HOPES SHALL BE GRANTED! The thing you fear will not come to pass in 2017 — and your hopes shall be granted! God’s plan in 2017 is to prosper you — and NOT to harm you — your fears will not be fulfilled and your hopes shall be granted!! 2. GOD IS GIVING YOU THE POWER TO ACCOMPLISH ALL THE GOOD THINGS YOUR FAITH PROMPTS YOU TO DO IN 2017. You are being empowered by God to keep those good New Years resolutions that your faith prompted you to make for 2017! If you have already fallen short, get up and take a step toward Him. You will not need to grit your teeth and tighten your belt to accomplish the new and good things God has prepared for you in 2017 — God’s grace, which is His empowerment to do the good things your faith prompts you to do in 2017 — is being released to you in a greater dimension than ever before. Just thank Him! Remember, 2017 is 365 days — divide your goals into bite sized chunks — each day is a new opportunity to receive God’s grace and mercy — and to forget those things that are behind you and press FORWARD to the mark of the prize of your high calling in Christ! 3. GOD IS RAISING THE LEVEL AND REWARD OF YOUR DILIGENCE IN SEEKING HIM MORE IN 2017. As you raise the level of your diligence in seeking the things of God more in 2017 (His word, prayer, giving, helping others, fasting, obeying God, keeping Him first), there is a great reward that will be released from God to you in 2017! 4. GOD HAS PREPARED GIFTS, BLESSINGS, AND UNEXPECTED HARVESTS FOR YOU TO DISCOVER IN 2017. There are hidden, new things God has in store for you in 2017 that He will cause you to discover — to bless you and empower you in new ways as you seek Him and His kingdom this year. 5. 2017 IS GOD’S TIME TO FULFILL HIS DREAM FOR YOUR LIFE. Every dream has a test, and every dream has a time. You have passed the time of your test, and now is the time for the Lord to fulfill His dream for your life! I am believing God to do these five great things in your life as you take hold of them in Jesus Name!!! Lord, thank you for my friend that is reading these words today. God I ask that as they look to you in a greater way, that you will do exceedingly, abundantly above all that they can think or ask according to your power that works in them now in Jesus Name, Amen! 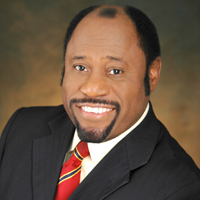 I just returned home from a sometimes tearful two day pilgrimage to the place “where God lives” – the beautiful Bahamas, home to the inauspicious birth, the unparalleled life and the untimely death of of my mentor and friend Dr. Myles Munroe, his regal wife Pastor Ruth and seven of their beloved staff and friends – who all perished in an internationally publicized, shocking plane crash en route to the Myles Munroe Leadership Conference on November 9th. My wife Jeri and I were honored to accompany Dr. Morris and Theresa Cerullo for the Myles and Ruth Munroe Homegoing Celebration where Dr. Cerullo had been invited to speak at the National Stadium as world leaders, esteemed ministers, family and friends were joined by thousands to honor this humble apostle of God and his beloved wife. For over 20 years I had the joy and privilege of booking Myles to speak in Dr Cerullo’s major conferences. Myles chose not to refer me to deal with an assistant, but would speak to me personally – and make most of his arrangements with me directly. And he wouldn’t just want to get the speaking details confirmed and get off the phone. He would always take time to invest in me and speak to the purpose of God in my life and ministry. He would ask about my health, my marriage, my family and my ministry. 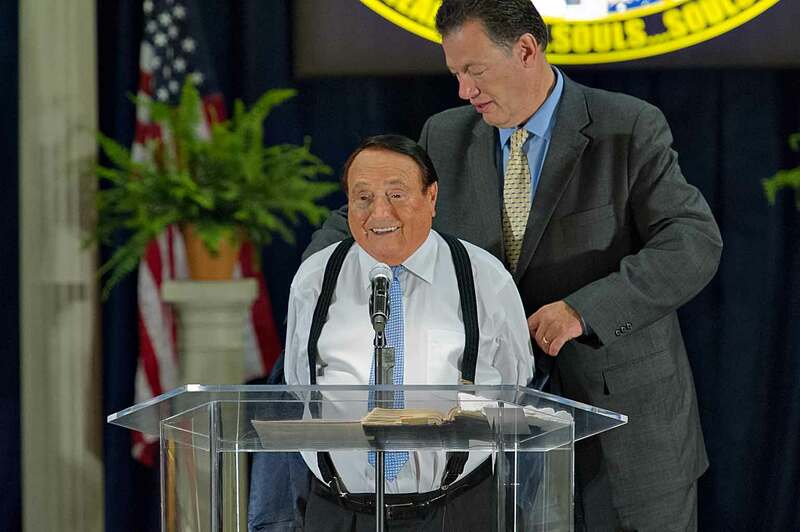 Along with Dr. Cerullo, it was Myles that urged me to write my book “The Blessing of Serving Another Man’s Ministry” and would call me to check on the progress. Dr Cerullo wrote the forward. After Morris, Myles was the first to read the manuscript and send me his most gracious words of endorsement, which are printed on the back cover. The last time Myles spoke for us was this past January – he called me several months before the conference to ask what the theme was — so that he could prepare his message to most effectively complement Dr. Cerullo’s vision for the World Conference. I shared with him that the conference theme was “Legacy”. After all this is Morris’s 68th anniversary of ministry — and at age 83, Morris and Theresa are in their legacy years — and building an incredible World Outreach Legacy Center on 18 prime acres in San Diego. Ruth glowed with regal beauty. Myles so happy by her side. “Make people greater than yourself and you will live forever”, Myles said that day. And that is what he did. Following the passing of Dr Munroe on November 9th this prophetic message has been viewed nearly 100,000 times. Now months later, I had forgotten how that at the close of his message, before turning the service back to me, Myles spontaneously held up a copy of my book and spoke very gracious words of endorsement and encouraged every leader to get a copy for their team, and every Christian to get a copy to learn the blessings of serving. Then, following the shocking events of November 9th, one email, then another, and another – from pastors and leaders – and believers from around the world – who were now watching Myles’ message on legacy and succession to the gracious end – began to overflow my inbox asking how they could get copies of the book. A little reminder that even from heaven Myles’ encouragement continued. My prayer is that I would make him proud. Your Setback Is God’s Set Up For Your Comeback! Was honored to share the message, “Your Setback Is God’s Set Up For Your Comeback” as the guest of Pastor Matthew Barnett at Angelus Temple, Dream Center in Los Angeles, California on October 9th, 2014. If you or someone you know is in a season of setback, or you are climbing out of a setback, I’ve got a word from the Lord for you that will accelerate your comeback…. A setback is an unexpected change from better to worse, a disappointment, a reversal. Now is the time for your comeback to begin! Your failure is not final. Your failure is not fatal. But if you will let God, He will use your failure as fuel for your future. In fact, your future is wrapped up in how you respond to your failure. 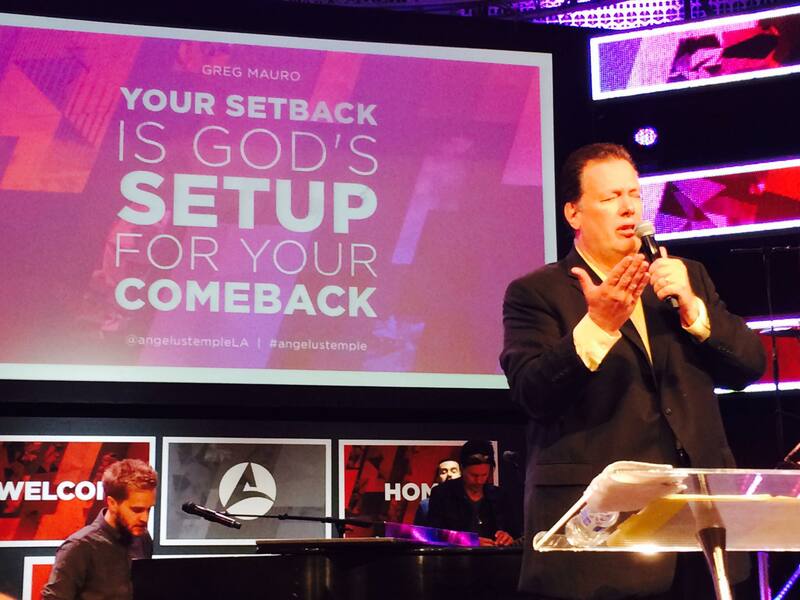 It is time for you to see your setback as God’s opportunity and even as His setup for your comeback! What does God call you? God doesn’t call you failure. He sees more in you than your best friend, than your family, even more than you do – even in your setback, He calls you righteous! Your mess can become your message; your test will become your testimony! A divine exchange is about to take place in your life. There’s no condemnation if you find yourself in a setback, in an unexpected change from better to worse, a disappointment, a reversal. I have prayed for you, and I wrote this to tell you that this time will be different. Change is coming to you now in Jesus name because I know that your setback really is God’s setup for your comeback — and your comeback is beginning right now! A comeback is a return. This is your time to return! A comeback is a resurgence. Now is your time for a mighty resurgence in your life! There’s somebody God is speaking to that is at the very brink of giving up. You are out of fuel; your tank is on empty. I want to tell you that a resurgence is coming to you now. Your comeback has already begun! It’s a resurgence. It’s a recovery. Somebody say recovery is coming to me! You see God invests more in you when you’re low so that He then gets a greater return when you rise. Just like the stockbroker that buys the troubled stock at its low point – and sees the great growth potential – is rewarded when he invests and it rises, God too gets the glory and receives a greater return when he invests in you – and you comeback! God is fully invested in your comeback! A comeback is a return to success. You will not only return to the success that you once knew – you will far exceed it! King David experienced a terrible setback in his family. David’s daughter Tamar is seduced and raped by one of David’s sons, Ammon, who is then murdered by another son, Absalom, to take revenge. Oprah, Dr. Phil have nothing on this! As a result Absalom is banished from the kingdom. So David lost a son to murder, had a horrendous thing happen to his daughter, and then his beloved, yet murderous Absalom is banished from the kingdom because as King, though he loved his son, he was charged to uphold the law. That’s where this entire world was before God sent Jesus. We were banished from a loving yet just and holy God because we all have broken the law. It was sadly reported recently that the last recorded words of the Liberian national, Thomas Duncan, who passed away from the Ebola virus in the Dallas hospital were, “I miss my son. I want to see my son”. And here’s David, he longed to be reunited with his son Absalom. It’s appointed unto every single one of us to die and then the judgment. Not then the reincarnation. Not then the purgatory. There is a heaven. There is a hell. Jesus never would have come and paid the price that He paid if there was some other way that we could have made heaven. All of us must die eventually. You can’t get your past back, but God isn’t interested in holding your past against you, He is interested in your great future. Paul focused on forgetting the past and looking forward to what lies ahead. If you will do that today, you will be on the comeback trail! God doesn’t give the divine back hand to anyone. You are inestimably valuable to God. Your value was demonstrated by the unspeakable price that God paid to redeem you. God doesn’t just sweep you away because you have fallen in this area or you have fallen in that area. God invests more in us. Jesus left the 99. He gave more of His time to the one than left than the 99 that stayed. II Samuel 14:14 says, God does not just sweep life away. Instead, He devises ways to bring us back when we have been separated from Him! That is our God. God doesn’t devise judgment. God doesn’t devise revenge. God devises ways to bring us back when we’ve been separated from Him. If you have a relationship you cared deeply about that turns on you, disrespects you, betrays you, doesn’t want to be near you, would you be devising ways to bring them back? No. But the overwhelming message of Scripture is that we serve a God who even when we disrespect and dishonor Him, devises ways to bring us back when we have been separated from Him. He devised a way for Jonah. There’s somebody reading this — you have the call of God on your life. And God told you to go to done thing – and you did the other — just like Jonah did. First, the storm that Jonah and all those with him encountered on the ship that was taking him away from the place God called him, then Jonah getting the short straw and being selected to be thrown off the boat, and finally getting swallowed by a fish! God devised a way to bring Jonah back. Sometimes it’s not pleasant. God has chosen to be committed to you and to His plan for your life. God has a great plan for your life. If you’ve had a setback in obeying God’s will for your life, as you are reading this you have an opportunity to step into your comeback by just saying God I want to take the first step back to what you’ve called me to do. Maybe you have experienced a setback in the relationship you once had with the Lord. Your relationship right now is not as strong, it’s not as on fire as it used to be. They’re simple words, but for some people they’re the hardest words to say, “I HAVE SINNED”. You have an opportunity to pause right now — because your comeback can immediately begin with those three words. You can be restored and the blessing of God can be released upon your life NOW. You see, God devises ways to bring us back when we have been separated from Him! The dictionary defines devise as “to cook up”. Did you know that God spends every moment cooking up ways to bring you back! He’s like a master chef mixing together the sweet and sour ingredients of your life to cook up something gloriously delicious! The dictionary also defines devise to mean mastermind, blueprint, and design. God is masterminding, blueprinting, and designing your comeback! Finally I want to close with an incredible man that many will relate to. He found himself in a terrible setback. Sometimes our setbacks, if we become overwhelmed with them, if we become consumed with them, and many times we do, they begin to define us. They begin to define how we see God. This is Satan’s ultimate plan – using our setback to define us and accuse our God. There was a man named Gideon. He was in an incredible setback. I’m not going to go through the whole story but you can read it in Judges Chapter 6. The Bible says that he was in fear. He was threshing wheat at the bottom of the wine press. The wine press was where the grapes were trodden, not where the wheat was threshed. Gideon was in fear and as a result was out of place. Maybe you’ve allowed your setback – and your fear – to cause you to be out of place. There were two voices over Gideon’s life. There are two voices over every person’s life. There’s the voice of the accuser and there’s the voice of the Intercessor. I wrote this to tell you that Jesus is praying for you and the devil is a liar. The accuser will tell you, you can’t. The intercessor will tell you, I will. I’m going to tell you something — you are not under the judgment of God. I’m going to say it again. You are not under the judgment of God. You are under the intercession of God! God is not punishing you. I’m going to say it again. God is not punishing you. Now He may be correcting you, but He punished Jesus 2,000 years ago and He who knew no sin became sin so that we could be made the righteousness of God in Christ Jesus. You know what God’s doing? He’s devising ways to bring you back because He loves you so much. You know what God is doing? He is praying for you. The devil loves to use our failures to lie to you and to condemn you. But if you will stop looking at the bigness of your need and begin looking at the bigness of your God, you will find that starting right now; He will take you step by step. And each step will be a miracle! There’s somebody reading this, maybe you feel like you’re at the bottom. Gideon was at the bottom yet the angel wasn’t so high and holy and mighty that he didn’t come and meet Gideon right at his very bottom point. Judges 6:11 says that Gideon was trying to hide the grain from the Midianites because they would come and steal it. I don’t know if there is anybody that ever feels like, my harvest keeps getting stolen. I tell you, your setback is God’s setup for your comeback! How could this angel say such a thing? God was depending on what He could make of Gideon! God is depending on one thing. God is depending on what He can make of you! In a time of setback who has not questioned God? Have you? The Hebrew literally means the Lord faced him! He wasn’t depending upon what Peter possessed. He was depending on what He could make of him. The greatest faith in all the world is not the faith that raises the dead…it’s not the faith that believes in God’s grace and miracles. The greatest faith in all the world is the faith that God has in you! Anybody ever said, “How can i?”, or felt like they were the least? Did you know that God specializes in using the least? When Samuel came to anoint the next King of Israel and he went to the house of Jesse — Jesse brought out 7 sons and Samuel took the oil and tried to pour it out and it wouldn’t come out for son #1, or #2, or #3, on down the line until #7. Samuel said Jesse, do you have another son? Oh yes, but that is David. He’s out tending the sheep. He’s the youngest. Samuel said bring him in. And in comes lowly David, and low and behold, Samuel turned that vial over and oil poured out! God chose David. There’s oil that’s reserved for you. I love again how the Lord responds as Gideon tries to disqualify himself for who God has called him to be and what God has called him to do. Whoever you are and wherever you are reading this, the Lord wants you to know that He has not forsaken you or left you – surely He is with you! God wants to restore you and release a fresh anointing and blessing into your life. Your setback is nothing more than God’s setup for your great comeback story, and your comeback begins now.